1. Focus on one-off artworks/sculptures to sell through galleries, gallery stores and selected shops. 2. Experiment with lighting, starting with translucent polymer clay covered candle holders and then larger scale electric lighting (this may involve some non-polymer clay materials for larger scale pieces but it is something that really inspires me). 3. Try and win an international polymer clay award, to add credibility to my teaching ability. 4. Expand locations to teach polymer clay workshops. 1. I have created a number of one-off sculptures: ‘Rainbow Cauldron’, ‘Colour Play’ (wall hanging), ‘Global Reflections’ and ‘Colour Rings’. As I have only sold one these and still have my ‘Out-of-this-World’ sculpture, I am running out of storage space in my small studio. This is making me think that I would be better going back to 2-D artwork which I can hang on the wall. Also, as mentioned in my post of 1 October, I want to spend more time developing my ‘dot mosaics’. 2. 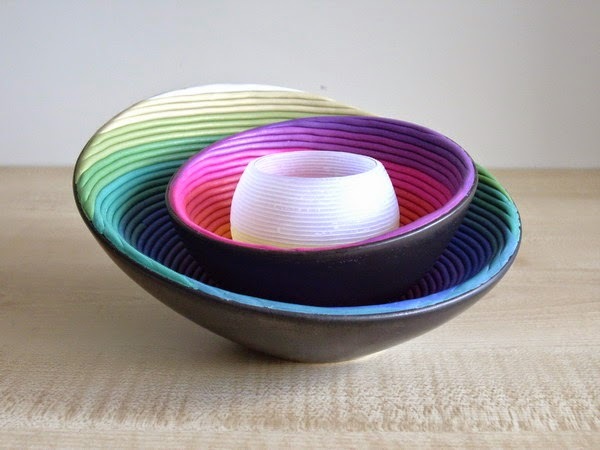 I have made some LED candle holders with polymer clay over spherical glass bowls. These are quite effective but I still need to do more experimentation to be able to make large self-supporting hollow polymer globes that could be used as lampshades for electrical lamp bases. My fear is that polymer may not be strong enough at the thinness required for translucency and that I might have to move to a different medium to achieve the effects I have in mind. 3. The receipt of a ‘Best in Sculpture’ award for ‘Spring Trio’ at the 2014 IPCAwards, presented at the EuroSynergy Conference in Malta, was the highlight of this year for me. It gave me a tremendous confidence boost but then actually made it really hard for me to create anything new, as I was scared that whatever I did next would not live up to my winning piece. 4. Apart from teaching a short course of polymer clay evening classes at Glaze Ltd, other polymer clay workshops have waned because of lack of participants, which is disappointing after the amount of time I spent last year preparing teaching material. This year has led me to review the workshops I offer. I had hoped that teaching through recognised art centres would make it easier to attract students than doing the promotion myself. Whether it is a sign of the times or still the fact that New Zealanders are not aware of or interested in polymer clay, I am not sure. Anyway, I have decided to take a year out of teaching so I can concentrate on my own work and will only teach small groups of up to four, at home, if approached. 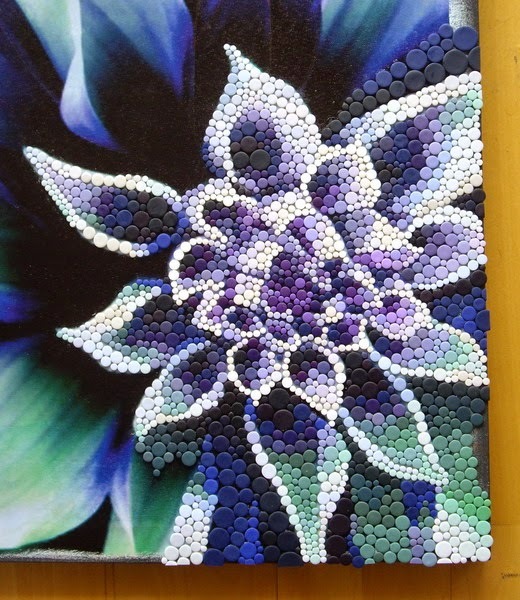 Once I have developed my dot mosaics further, I might look at teaching workshops on this technique, with the emphasis on contemporary mosaics rather than polymer clay. It seems such a shame to do this but I so enjoyed the teaching and apart from the few regular members of the Auckland Polymer Clay Guild, it seems so hard to raise general interest in polymer clay. 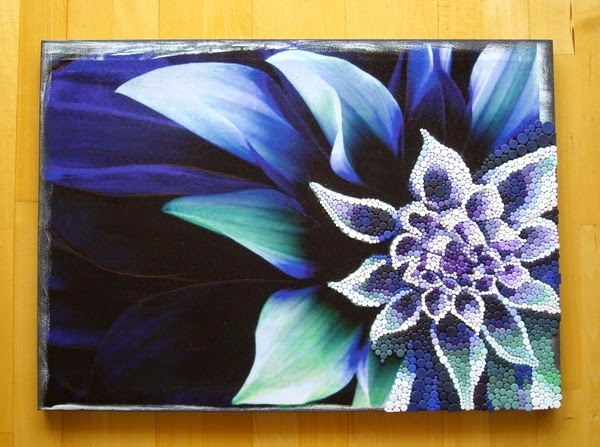 This is why I may have to place the emphasis on mosaics – and then introduce polymer clay through the back door. I am really pleased with how my first dot mosaic is taking shape but there is still a long way to go. Unfortunately I did not complete the whole picture in time to enter it in the Members Merit Awards exhibition, at the end of November, which was my original plan. I had no idea how long it would take me, and at the rate it is going, it might just be ready for the exhibition next year. As this is my first artwork using this 'dot mosaic' technique, I want it to be the best I can do, so it will take however long it needs. I have no idea how long this will be but I am finding it hard to continue at the moment, due to social events and planning the run up to Christmas but more so because I feel some trepidation about what will happen when I eventually come to grout it. After all the hours I will have spent making the tiles and gluing them in place, I would hate to ruin the whole piece by using the wrong grout mix. As I have used an art canvas as the base, I need to make sure that the grout will flex and not crack. To put my fears at rest, I have decided to make a small dot mosaic on a canvas, so I can experiment with the grout mix before I apply it to this piece. I am not likely to get any more studio time in before Christmas now so here is how my artwork, titled 'A New Approach', looks now. Next year I will post more progress photos as the dot mosaic develops. 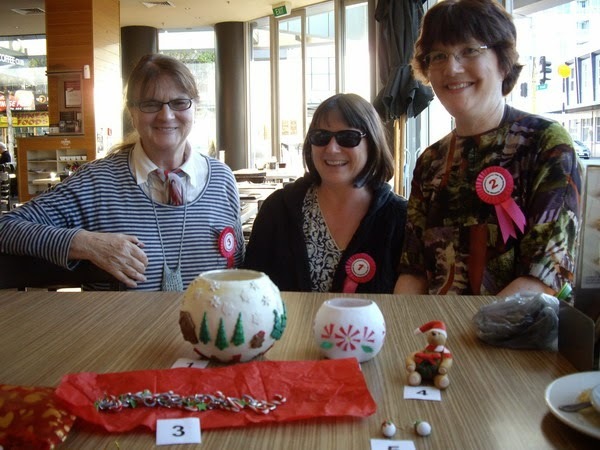 Tuesday 2 December was the Auckland Polymer Clay Guild's last meeting of the month. 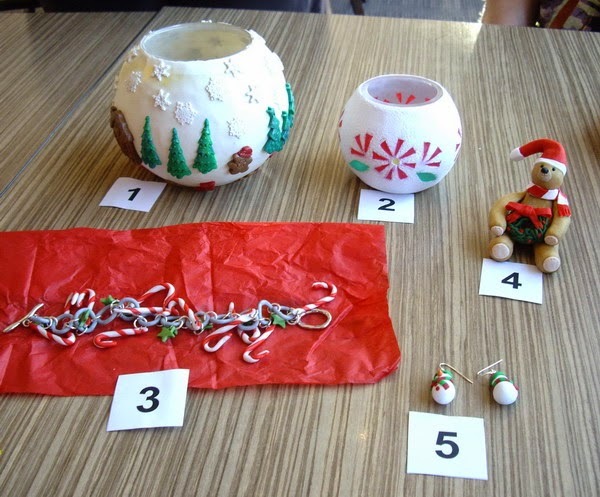 Below are the entries from participating members for the Christmas Challenge 2014. The challenge was to make anything with a Christmas theme. Thank you to everyone who took part. Wishing you all a great Christmas and hope to see you next year. The first meeting of 2015 will be Tuesday 6 January. Unfortunately I did not get my first dot mosaic picture completed to enter in this exhibition (still a long way to go, so it may be just be ready for next years) but I did enter two sculptural pieces, shown below. I briefly attended the opening of this exhibition before moving on for the Auckland Polymer Clay Guild's last meeting of the year, which just happened to be on the same night.